During his keynote at Word Camp San Francisco last year, Matt Mullenweg, the man behind the platform we all love shared a fact that probably shocked even the most enthusiastic members of WordPress community — one in twelve websites across the globe is powered by WordPress. There’s no way to tell what the exact number of websites in the universe is, but according to Pingdom, in December 2010. it was somewhere around 255 million, with 21.4 million websites added in 2010. alone. As much as I love “you do the math” phrase, I’ll do it for you. That’s 20+ million WordPress websites, with 1.5+ million added in 2010. So, just how diverse are they? Extremely. There’s no other answer. While it is true that most people unfamiliar with how WordPress is progressing still see it as no more than a blogging platform (which it is, if you only use a small portion of what it can do), it can also be so much more. This is not a list post, so I won’t dig into the specifics, but feel free to explore what other folks had to say about it. So, there’s two main groups, custom and public themes, main difference between them is who gets to use your theme. With custom themes, you will know who your users are, with public themes you can only guess. Also, custom ones tend to be less general, while public themes, being aimed at a much broader audience usually have to cover a lot more angles and please a lot more (very different) users. A good analogy would be a person that’s looking for, or has found love of her/his life vs. one that’s still actively playing the field. The romantic one spends his days focusing on improving the attributes that make her/his chosen one happy, while player has to make everybody interesting, because you never know who might want to play next. 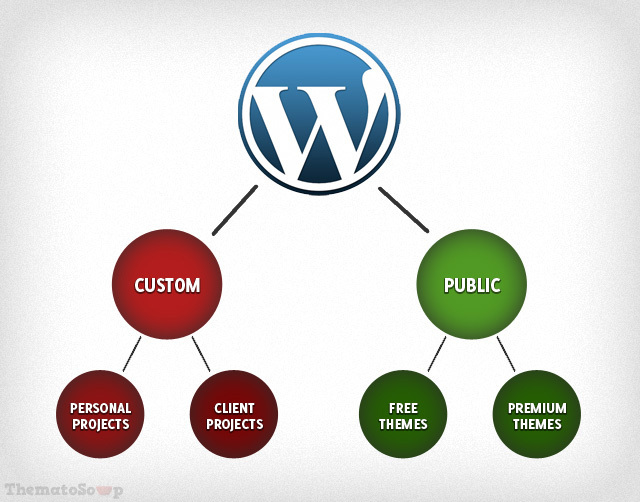 Each one of two main categories of WordPress themes can be split into sub-categories — personal and client projects for custom themes, free and premium for public themes. Here are some specifics. No restrictions, no need to worry about client being unable to use it, WordPress themes for personal projects are an ideal way for developers to learn new tricks which can later be implemented into paid projects. It’s all about doing what you think is cool or might help you in the future. Show me the money! Out of four sub-categories, this one marks the most direct path to paychecks, however, depending on the client, it can also be the most frustrating one. Also, unless you’re lucky enough to work with creative clients, this category will hold you back the most (“the money is there, why should I bother to learn anything new?” syndrome). If done right, they can be a great marketing tool which can bring you clients looking for a custom theme or help you build a name for yourself and that way make it easier to promote your premium themes. Not only that, but they’re also a great way to learn about developing for an unknown user and probably the best way to prepare for developing premium themes. They’re usually more general than custom themes (unless you’re building a niche theme) and less feature-packed than premium ones. No WordPress developer should skip this step in her/his career. The most difficult ones, by far. With so many talented developers already creating awesome premium themes, why would you even consider doing this? Because, as difficult as it is, this is the path you want to take if your goal is to perfect your skills. I’m not talking about just improving them, what I mean is forcing yourself to become the best you can be. Why do premium themes help this cause? There’s two main reasons. One, you really have to learn all sort of stuff if you want to be able to develop the kind of features that will make your theme competitive. Two, with a large number of customers (hopefully) buying your theme it’s a lot more likely anything you screwed up will be spotted. If you don’t want to avoid that, for a number of reasons, premium themes are not your thing. Since we all love chart, here’s how this looks in one. 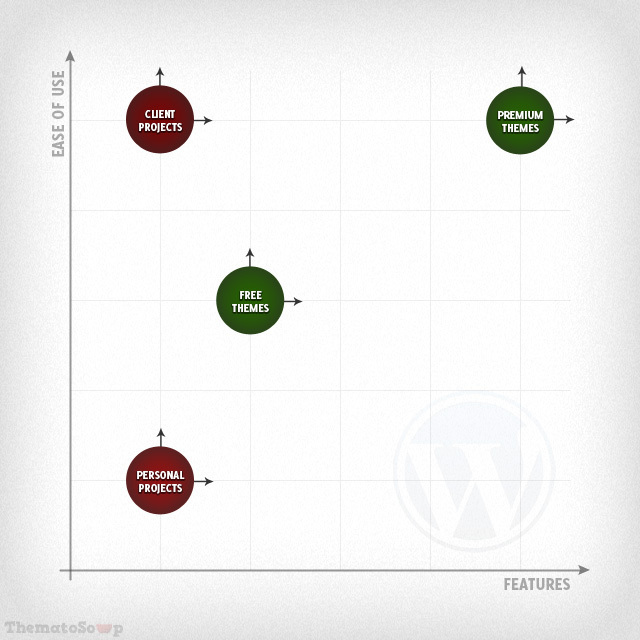 Keep in mind that chart represents usual minimum of what a theme should do, but it doesn’t necessarily have to be like that, especially with niche public themes (less features), or with skilled clients (themes don’t have to be as easy to use as if they were built for WordPress first timers). This was a long post, but I hope you feel like it was worth reading. Feel free to join the discussion by commenting. Next up, we’ll take a look at differences between niche and general premium themes.